Background: Hypoxia renders tumor cells refractory to treatment. One way to overcome this problem is the design of drug delivery systems that contain the antitumor agent within an oxygen supply medium. Objective: to evaluate whether the perfluorocarbon liquids (capable of retaining up to 50% v/v amounts of O2 gas) can be tools for delivery of photosensitizers to hypoxic tumors. Method: We synthesized a series of compounds in which fluoroaliphatic or fluoroaromatic moieties were conjugated to the porphyrin ring in meso-positions. Two derivatives were tested as the solutions prepared either from a dimethylformamide stock (‘free’ formulation) or from a perfluorocarbon emulsion in which the photosensitizer is entrapped in the oxygenated medium. Results: In the emulsion the hydrophobic photosensitizer and the gas transporting liquid represented a biocompatible composition. Free formulations or perfluorocarbon emulsions of fluorinated porphyrins evoked little-to-null dark cytotoxicity. In contrast, each formulation triggered cell death upon light activation. 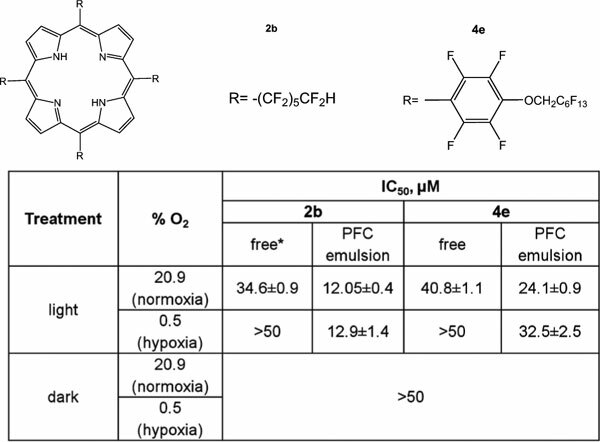 Photodamage in the presence of fluorinated porphyrins was achievable not only at normoxic (20.9% O2 v/v) conditions but also in hypoxia (0.5% O2). With new compounds dissolved in the medium the cell photodamage in hypoxia was negligible whereas a significant photodamage was achieved with the emulsions of fluorinated porphyrins. The derivative with the fluoroalkyl substituent was more potent than its structurally close analog carrying the fluoroaryl moiety. Conclusion: Our new fluorinated porphyrin derivatives, especially their emulsions in which the photosensitizer and the oxygenated medium are coupled into one phase, can be perspective for photoelimination of hypoxic tumor cells. Porphyrins, fluorine, perfluorocarbon, emulsions, photosensitizers, reactive oxygen species, hypoxia, tumor cells, cell death.